In the good old days I was more familiar with my music collection. Not only was the collection a whole lot smaller, but I could store the albums in a way which meant that a new album was less likely to be bought, played, filed, but then forgotten. 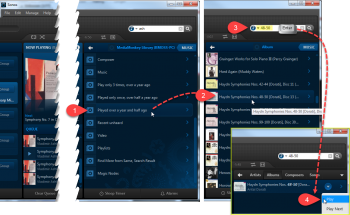 MediaMonkey, like most music browsers, offers a browsing mode to replicate cover browsing. But as the collection grows larger it is becomes overwhelming, and cries out for more targeted filtering options. The human brain is busy, and is tuned for quick pattern matching. If I start browsing through my full collection, I am quickly going to find something I feel good about hearing. It will happen early in my search, and this leaves a lot of dark corners which I never even passed over, and which I may never revisit. If that is the case it pretty much kills my satisfaction from collecting. Of course, I can reduce the browsing pool by filtering to show just those items recently added to my collection, or browse amongst this artist, or that genre, but that is not enough in a large collection. 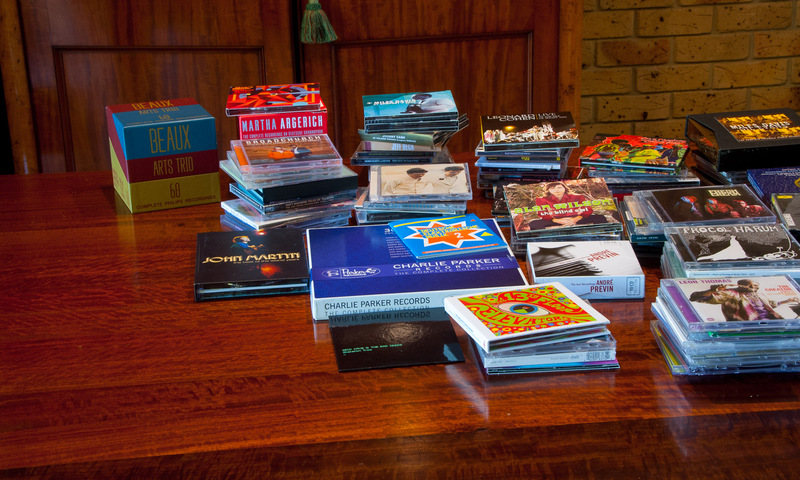 You can chose to browse amongst just those albums which you haven’t heard for a year … still too many? … make it just those not played for a year and a half, … or maybe browse amongst just your neglected Jazz albums, or just those forgotten albums which you have played less than 3 times in total. The addition of inclusive play counts restores a much greater level of intimacy with a large collection, as it narrows to a smaller pool. One which is continually refreshed as you play from the suggestions, and which keeps throwing up great choices that you may otherwise never have gotten back to. MediaMonkey allows you to design your own custom “collections”. In the example above I filtered out a couple of genres that I don’t care about, and then restricted it down to only albums which I hadn’t heard for a year. I also filtered out any album which I hadn’t played for over a year and a half, because if I hadn’t played it after six months worth of nagging, I should probably stop considering it. The rules only need to set up once. 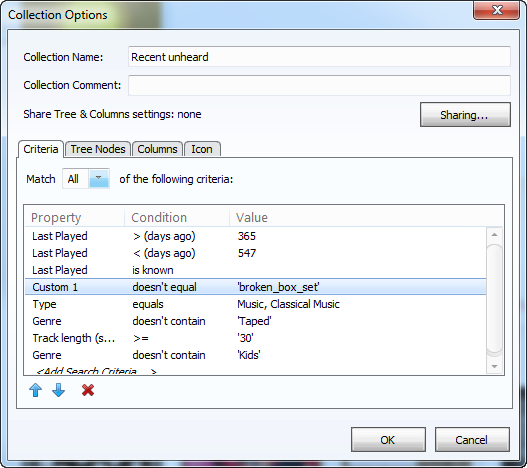 As AlbumPlays harvests and imports your fresh plays, MediaMonkey will automatically update the browsing index for this “collection”. Here is the specification of the index illustrated above. Sonos owners: I can browse these collections using my Sonos controllers. Sadly I can’t queue an album to my Sonos from them. This is due to a disappointing Sonos limitation (vote here to request that this get fixed), but the situation is not as bad as it initially sounds. The Sonos “universal” search feature makes it very efficient to relocate any album chosen while viewing a MediaMonkey index. Sometimes I like to listen to my collection when my PC is turned off, ie. when my MediaMonkey indices are unavailable. This could be late at night, or when I am travelling away from home. 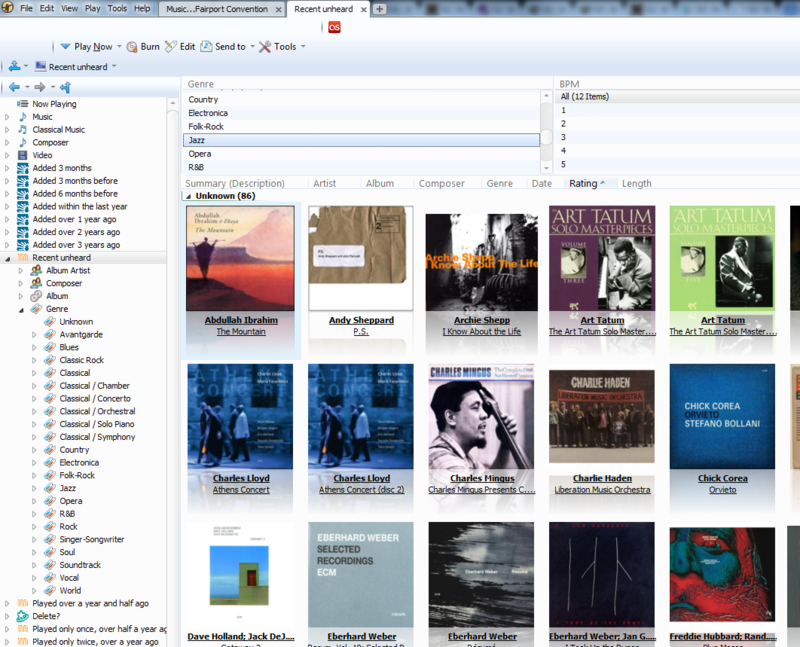 AlbumPlays can also define, generate and housekeep, playlists which may be used across multiple situations. At night I play them using a pair of Bluetooth headphones and a UPnP client on my tablet playing from my NAS. When I am travelling I use one of those relatively cheap 2tb WiFi usb drives, upon which I have replicated my whole music collection. Or if I am commuting I use the playlists to stream from my Google Play Music library, where I took up Google’s offer to upload my whole collection to their servers, at no charge. 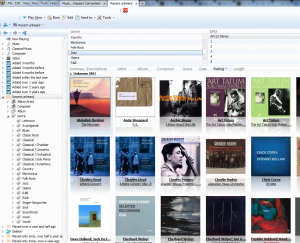 This means that I can browse, select and play a neglected album or tracks, in any of these situations, without having to pre-prepare by syncing music to my tablet, nor having to downgrade my large lossless tracks down to small tablet-friendly MP3 files. And of course when I complete playing any re-discovered track or album, it is removed from the MediaMonkey “collection”, and also the playlists, because AlbumPlays will ensure that all of the scrobbled track plays find their way back into MediaMonkey. If your play count data is to be useful in this manner, it is important that it be accurate and complete. This may sound pedantic, but it does make a significant difference. 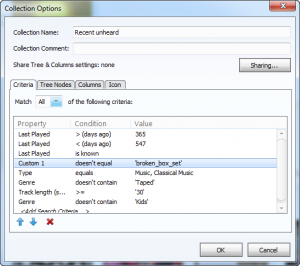 it is best if your date-based indices are based consensus date last played and play count for the album as a whole, rather than using the play data from each of the individual tracks … this is to avoid an album, with differing track play counts, from being broken apart when viewed filtered or sequenced by play count … also to avoid album break-apart if the most recent album play was interrupted by a track from another album. 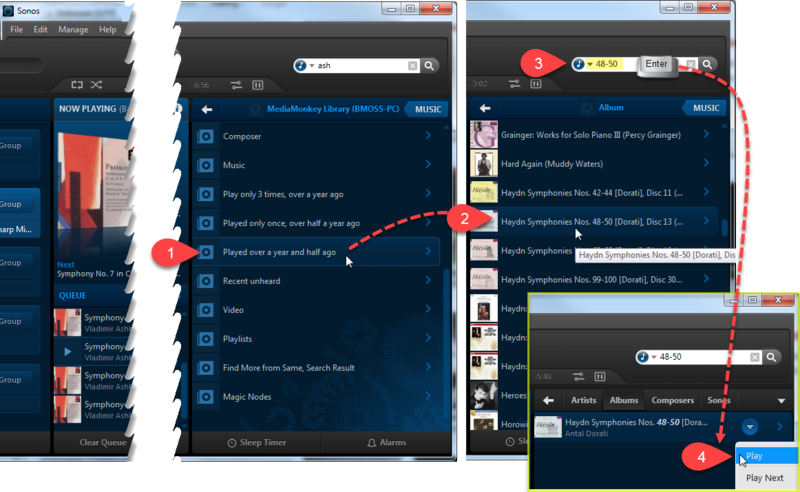 if you are playing whole albums in their natural track sequence, AlbumPlays will notice if a track, or tracks, are omitted for some reason. If it determines that there was an unaccounted for gap in time, long enough for the missing tracks to have been played, it will resurrect the lost scrobbles unless you reject them. if you are playing using a Sonos, and are using my scrobbler, you will experience significantly less scrobbles loss. I found that over 4% of my Sonos scrobbles had been lost prior to switching to AlbumPlays scrobbling. Other people using AlbumPlays have reported a similar level of loss using the native Sonos scrobbler. Firstly I cache the play observations, so if Last.fm’s submission service is overloaded or you have an Internet disruption, it submit these when service is resumed. Secondly AlbumPlays uploads your Sonos plays into MediaMonkey independent of whatever Last.fm does to mangle your scrobble submissions. Next PostNext Want your whole music collection available when travelling?